Heat oven to 450°F. 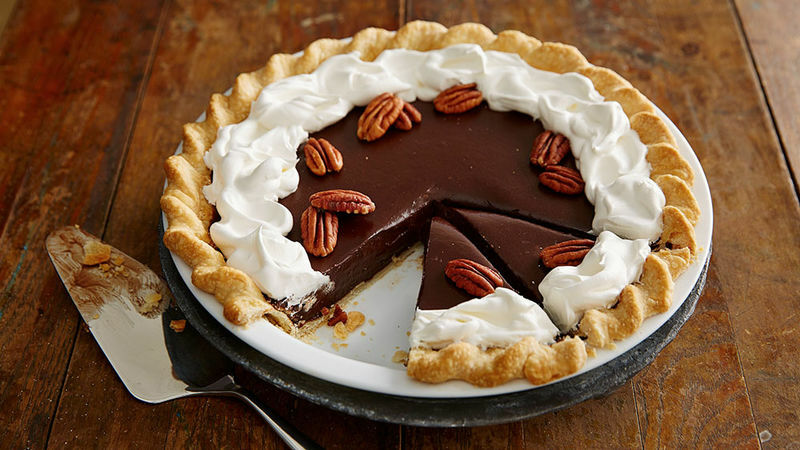 Make pie crust as directed on box for One-Crust Baked Shell using 9-inch glass pie plate. Before baking, sprinkle chopped pecans over bottom of crust; lightly press into crust. Bake 9 to 11 minutes or until lightly browned. Cool completely, about 15 minutes. Meanwhile, in large bowl, place chocolate. In 2-quart saucepan, heat 2 cups of the whipping cream over medium heat just until it begins to boil. Pour over chocolate. With electric mixer on low speed, beat 1 minute or until chocolate mixture is smooth. Pour into cooled baked shell. Refrigerate at least 4 hours or until serving time. Just before serving, in small bowl, beat remaining 1/2 cup whipping cream with electric mixer on high speed until stiff peaks form. Spoon or pipe whipped cream around outer edge of pie. Top each serving with pecan half. We don't recommend using chocolate chips to make this pie as they will not produce the same smooth filling as squares of baking chocolate.